This was in my mailbox; an invitation to renew my magazine subscription. My subscription hasn’t expired yet; I’m still receiving a copy every month, but the point of the renewal notice is to ensure that my subscription will continue on without any interruption. That’s the ideal, but life can be hectic, the notice gets tucked back in the stack and tossed out. Or I open it, fill it out, seal it up, but can’t find a stamp so it eventually disappears to wherever all unstamped correspondence goes. Or I open it, think I’m gonna do that online right now, pick up my iPad and wow – 12 Facebook notifications… Three months later I walk past a newsstand; I see the current cover of “my” magazine and think, “I don’t remember getting that this month…ohhh.” Magazine companies are seemingly impervious to rejection, and undeterred by my neglect, forgetfulness, or disaffection. 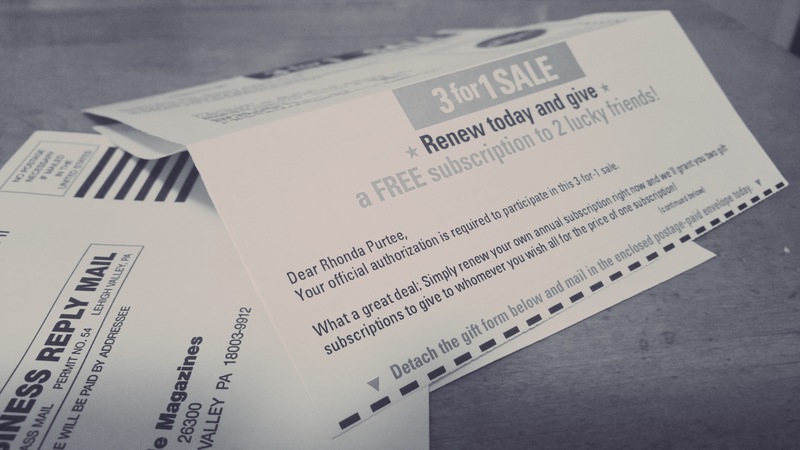 I can count on another renewal offer showing up in the mail letting me know that they want to begin my subscription again; there is no penalty, I just need to let them know that I want to renew. Renew: to make effective for an additional period.